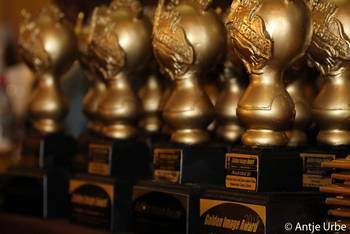 The Golden Image Award (GIA) was founded in September 2010. The GIA serves as the face for Liberia to recognize and appreciate those nations and individuals who, against all odds put in their time and resources to ensure that Liberia as a nation and people should be restored through their sacrifices and contributions during and after our 14 years of upheaval and corruption. It follows therefore that we should strive to recognize and reward those successful leaders and philanthropists who have helped one way or the other to support Liberia attain its current status. The GIA is premised on two (2) key rationales: to support the Government of the Republic of Liberia through innovative activities to rebuild Liberia's image after 14-years of devastating civil crisis; and to honor and recognize individuals who have made outstanding contributions to the peace process in Liberia and/or those who have significantly impacted their communities, the lives of other people, but where such contributions have gone unnoticed. Every time the Golden Image Award is held, it is meant to provide a unique opportunity to recognize individuals who have sacrificed and contributed to building a peaceful future generation ? leaders whose examples can be applied as practical ways to build and achieve positive legacies, promote and encourage effective leadership, and democratic rule either in Liberia or the global village. Designed as an annual event, the GIA is an integral part of Liberia's Independence Day celebration and it will aspire to maintain this precedence every year in the hope of supporting national leadership to sustain the peace and elicit the confidence of the international community to work with our Government and increase investment in our economy.